Daisy Margarine with BakePlus, made from pure vegetable oils, is excellent for baking, giving a more buttery taste to the end product. BakePlus helps to increase cake and creaming volume. 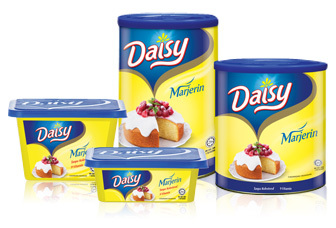 Besides, Daisy Margarine is versatile for other different applications such as cooking, pan-frying, barbeque and roasting. Daisy Margarine is cholesterol free and enriched with 9 vitamins; hence, it is ideal to use as bread spread for healthy growing children and families. Available in 250g, 500g, 1kg, 2.5kg and 4.8kg. Wish for a lighter, softer, smoother and creamier margarine? Wish no more! Daisy Soft Margarine is the ideal bread spread, baking and cooking which promises an even more buttery aroma and taste to satisfy those craving taste buds. It is refrigerator friendly. Once take out from the fridge, it spread just as smooth, almost like you've never chilled it.